Month: December 2013 - ThirtySevenWest ThirtySevenWest - Creative ideas about personalized custom ribbons, woven tags and labels, personalized gifts and more!!! Everyone tells you that your handmade garments, home accessories, and fashion creations are beautiful. You love to create, whether it be with incredible fabrics, supple yarns, or organic materials, and because of encouragement you’ve possibly opened a store on ETSY, or maybe have a website or Facebook page, but when you checked into ordering a sew in label to add a professional touch to your products, the minimum amounts were staggering! That’s why at Thirty Seven West we’re dedicated to providing an affordable alternative for emerging entrepreneurs in the fashion industry who want to label their products but don’t want, or simply can’t afford to pay hundreds of dollars to get their clothing tags created. We offer a number of gorgeous pre-designed sew in labels and clothing tags, as well as a variety of semi-custom choices that allow you to build your business and properly label your products. Beautifully brand your products with 1”, 5/8”, or 3/8” width cotton woven labels. These offer splendid array of color options, font choices, and lines of text. The best part is that you can order as few as 50 labels to get started for under thirty dollars. These sew in labels feature beautiful designs that will accentuate your products. Personalization options include one to three lines of text, plus you can order as little as 20 clothing tags for just seventeen dollars. 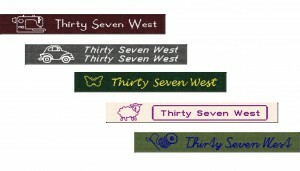 These fabric labels are perfect for crafting bazaars, church fund raisers, or any group project. 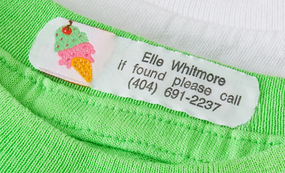 Our Iron on labels are perfect for starting your business or simply adding ownership tags to your children’s back packs, clothes for camp, or any fabric item. Super durable, these clothing tags last and last and you can choose from a wide variety of styles. Indicate your personalized text with up to three lines. These labels start at under $25. Starting a business requires so many drains on your time, energy, and budget, but at Thirty Seven West you don’t have to forget about adding a professional sew in label just because of the cost. Our effortless ordering process and experienced professionals can help you find exactly what you need to start labeling your creations like a pro. Contact us today for more information on affordable clothing tags and sew in label solutions for your emerging company. Bring in the New Year in style this season with personalized ribbon for New Year’s celebrations. What an exciting way to add a personal touch to your holiday party! This custom crafted personalized ribbon is an excellent choice for decorating ceilings, walls, windows, and lighting fixtures with your own unique style, and it’s available in a wide variety of designs, colors, and textures to make this year’s holiday party one to remember. Personalized ribbon for New Year’s celebrations can be used for more than just decorating your party facilities, however. Wrap it around champagne bottles, wine and champagne glasses, and party favors for one of a kind additions to your celebration. Create unique bows to add pizazz to your New Year’s gifts, table arrangements, and more, or order personalized ribbon that indicate the designated drivers at your get together. You can add text that proclaims, “Kiss me! I’m the designated driver,” or similar phrases that help keep you guests safe on the roads this holiday. Your personalized ribbon for New Year’s celebrations can be customized to meet the unique needs of your party, and can be designed to match virtually any decor. 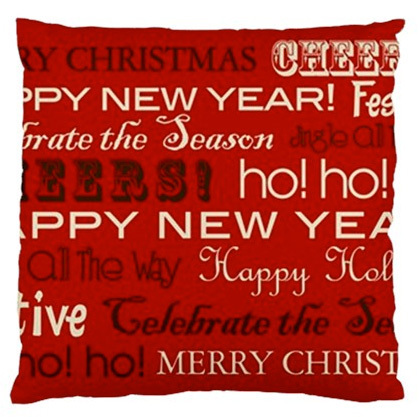 Add your personalized logo, name, or message, such as Happy 2014! Countdown the seconds to the New Year with a customized style that’s all your own this season when you order personalized ribbon for New Year’s celebrations! Unique Gifts for the Season! Sale lasts until December 9th, 2013 at midnight! 20% off Unique Personalized Gifts. Housewarming, couples, and newlywed gifts. Finding just the right gift for couples or newlyweds can be a bit of a stump, but not with our fabulous array of monogrammed pillows, designer cutting boards, or engraved frames. The stylish deigns make these personalized items the perfect gift for any household that beautifully combines quality with practicality. Gifts for Teens. We all know that shopping for teenagers can be dismally frustrating. For Aunts and Uncles, even Grandparents, it’s difficult to find presents that will thrill them without emptying your savings account because let’s face it, teenagers want only designer products. With our excellent selection of personalized hard case phone covers that fit the latest android and iPhone devices, you can add personalized monograms to the hottest designs, and give them a gift that they’ll love. Plus, a custom phone cover with their name can help prevent loss, substitution, or theft. Gifts for College Students. For struggling campus co-eds, other than offering probably much needed cash, you can give them something really useful and stunning with our splendid selection of iPad, tablet, and laptop covers and bags. Personalizing these items with their name, initials, or Greek affiliation provides a great way to transport their electronic devices securely from class to class, and the individuality of a customized cover makes it less likely that the expensive device will be accidentally picked up by someone else. Gifts for men and gifts for women. Whether you need to find just the right gift to show your devotion, or you want to treat a special person in your life to an indulgence item that they would never purchase for themselves in a million years, our extensive variety of personalized gifts will provide the shopping solution. Choose from sumptuous bathrobes, monogrammed soaps, or personalized flasks for women, or fantastic monogrammed whiskey barrels, engraved pewter mugs, or collegiate items that celebrate their alma mater. This holiday season, you can give gifts that anyone on your list will flip over when you shop our cyber Monday and year end sales. If you’re a little unsure about choosing exact items, contact us about available gift certificates. 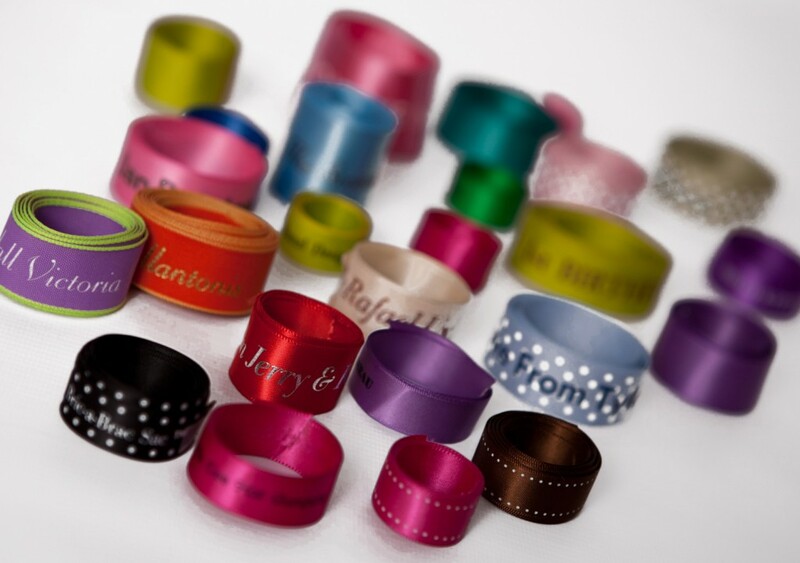 And don’t forget to order a few rolls of personalized ribbon that will make your wrapping stand out with wonderful printed text messages that you can design.